Looking for a funny way to spend Thanksgiving Day? After roasting the turkey, completing the meal preparations, one thing that you can’t miss is to recover from that food coma with a marathon of the best Thanksgiving movies. Following are 10 best movies ranging from heartwarming to historical dramas. Those movies have one thing in common: reminders that we can be thankful for lots of things — at Thanksgiving or any time of year. When Peppermint Patty (“C’mon, you can do it, Chuck!”) and her friends finagle Charlie Brown into serving a traditionalThanksgiving dinner, it’s up to Woodstock and Snoopy to make the day a success. Thanks to daring dishes like buttered toast and popcorn, and a memorable struggle with an uncooperative folding chair, Snoopy lends his own brand of wordless charm to the day’s events. As the gang gathers around a ping-pong table for their unique meal, the true meaning of Thanksgiving shines through. A classic for parents and grandparents alike — and sure to become a fast favorite of younger generations — this 1973 animated Emmy-winner tops our list for sentimental fun. This 1987 film follows Neal Page (Steve Martin) and Del Griffith (John Candy) on a journey of Odysseus-like proportions. The impromptu duo’s nearly failed attempt to return from a business trip in time for Thanksgivingdinner leads to a likeable stint of self-discovery. Soon, each man realizes he isn’t quite the easy-going-peach-of-a-guy he assumed he was, and we figure out that what started as a comedy offers a few redemptive lessons, too, like caring for a nearly total stranger. It’s enough to make us feel a little smarmy and wistful — which is just the right mood for a family Thanksgiving. Sandra Bullock’s Oscar-winning performance in “The Blind Side” made it one of 2009’s most viewed box office movies. Bullock, who plays wealthy no-nonsense Southern mom Leigh Anne Tuohy, takes in Michael Oher — a homeless football prodigy (Quinton Aaron) who eventually becomes a first-round NFL draft pick. The movie makes our top 10 not only because it’s a compelling account of actual events, but also because we can watch it time and again — particularly for the way it weaves together a family. Our favorite scene? When the privileged family tucks into a take-out Thanksgiving dinner in front of a blaring TV, then follows Oher to the dining room table for a conversation-filled meal that plays a pivotal role in the movie’s outcome. Crawl (Pauly Shore) is a big city boy who travels to the Midwest for Thanksgiving, pretending to be the fiancé; of a farmer’s daughter he befriended at an L.A. college. His guise as Rebecca’s fiancé; is designed to discourage an overly ambitious suitor in her hometown, but the strait-laced innocent (Carla Gugino) eventually falls for Crawl as he bungles his way through a series of down-home traditions. Even her suspicious family comes around in the end, as Crawl’s unflagging enthusiasm wins them over. For a fun watch that doesn’t require a lot of cerebral musings, this is a great pick for Thanksgiving viewing — for the whole family. A starlit cast, including Robert Downey Jr., Dylan McDermott and Anne Bancroft, lends acting prowess to a movie that explores the stressors of gathering with one’s family during the holidays. We particularly like this biting comedy for its gently redeeming conclusion. It’s a satisfying close to a storyline that finds Claudia Larson (Holly Hunter) losing a job, smooching the guy who used to be her boss and coping with a daughter who insists on spending Thanksgiving with her boyfriend. As this extended family gathers around a turkey dinner, the antics step up a notch, which is why this movie made our list. 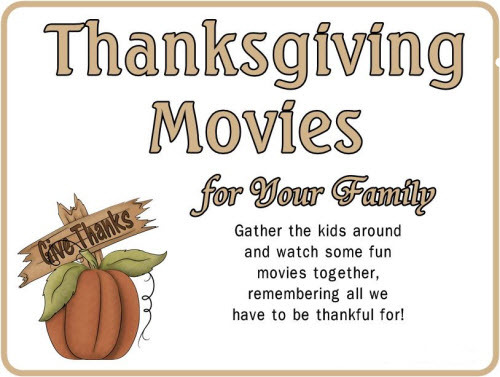 It’s entertaining, and has just the right feel for our Thanksgiving movie marathon. “Pocahontas,” a 1995 Disney animated film, offers a fictionalized look at Native American Pocahontas and Englishman John Smith as English settlers meet Powhatan Indians in Jamestown. It also makes a nice follow-up to the realities of “The New World,” and we especially like suspending disbelief when Pocahontas visits Grandmother Willow, an advice-offering tree spirit. The movie’s sure to bring back memories for the teenagers who viewed it as toddlers, and it’s perfect for helping a new generation of children wile away a pleasant hour. Pastoral landscapes, swelling instrumentals and gripping narratives make “The New World” a compelling recount of the Thanksgiving settlers we’ve heard about since early childhood. At the heart of this movie is a story of love found and lost, but don’t let that sway your opinion. There’s plenty of action, too. Still, the dynamic between John Smith (Colin Farrell) and native princess Pocahontas — each sent reeling by a clash between cultures — offers a number of scene-stealing moments. In many ways, this movie is a coming of age story, not only for these pivotal characters, but for an emerging nation. Intense, and sometimes unflinchingly poignant, this depiction is worth a watch. Long before she wed Tom Cruise, Katie Holmes played the lead in “Pieces of April,” a 2003 comedic drama. At the center of it all is Thanksgiving dinner, which April attempts to whip up in her cramped and less-than-clean New York City apartment for a cast of snarky, largely estranged family members. We admit that while her apartment makes us want to grab the nearest disinfectant spray, it offers an interesting backdrop for the action that ensues. Although the movie has an amateur pallor, it makes up for it with quirkiness and an emotionally satisfying conclusion — and makes the list of our Thanksgiving movie picks. Ed O’Neill (of ABC’s “Modern Family” and “Married with Children”) stars in this 1991 comedy about a meat-and-potatoes construction worker’s attempt to stay firmly ensconced in his girlfriend’s good graces — by retrieving her preppy son from boarding school in time for Thanksgiving. Although we fully admit the movie was indeed panned by critics at the time of its release, that hasn’t stopped us from keeping it in our “10 Best.” We think it has a number of redeeming qualities — namely, a cross-country road trip filled with comedic situations. And, it’s clean enough to watch with the grandparents or the junior set. How can you go wrong with that kind of set-up? A Thanksgiving classic, “Alice’s Restaurant” hit the big screen in 1969. This larger-than-life recreation of Arlo Guthrie’s song of the same name is an entertaining romp through 1960s pop culture, complete with a firsthand account of anti-war sentiments. After Guthrie visits his friend Alice for Thanksgiving, he offers to transport her trash to the dump, where he encounters a closed landfill. A series of decisions prompts him to push the garbage into a gully. When Guthrie’s caught by local authorities, a memorable court appearance is followed by a series of legal events in which the Army finds him unfit for military service. Enjoy Pavtube 2015 Thanksgiving Day big coupons with up to 40% off discounts for Blu-ray/DVD/Video conversion software.